Former Bosasa chief operating officer turned whistleblower, Angelo Agrizzi has made a return to the Zondo commission of inquiry and has concluded his testimony. Agrizzi concludes his testimony, he is excused and Zondo adjourns the commission until Monday morning, 10:00. Pretorius: "You have yourself conceded that to one degree or another, you were involved or aware, right from the beginning, of corrupt activities. You were either aware or participated throughout the period." Agrizzi says this is correct. Agrizzi says he didn't mean to confuse anybone cpncerning the donation, it was for the ANC. "It was either R8 or R10m, it is very easy to track," Agrizzi says. Agrizzi: Chair, I asked the investigation team to pull out Bosasa's bank statements to see the full amount. Agrizzi says an "arms' length company" paid for Gillingham's legal fees. Pretorius asks Agrizzi to elaborate on Top 6 allegations he mentioned yesterday. Agrizzie elaborates on screenshot, says the 'war room' was created for national elections at Bosasa head office for 2 months. Pretorius presents a screenshot from the video. Lamozest: a company Agrizzi says was created for "the senior white employees". Used "as a cover up for expenses, strictly, just for the family". This included the houses built for children. 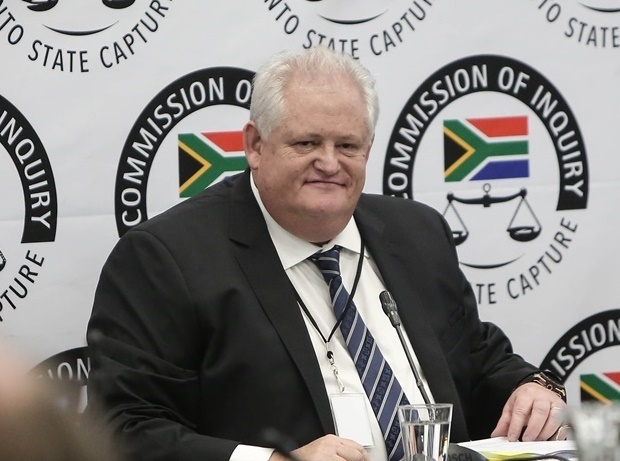 Agrizzi on Bosasa's purpose in assisting Gwede Mantashe - "At first, Gavin was elusive but he said it was because Mantashe is a brilliant connection to have"
Agrizzi says Gavin Watson told him the security was installed at Gwede Mantashe's various properties because he was a brilliant contact to have as the ANC secretary-general at the time. "There is no possible way that Leshabane could have made a donation of that kind personally," says Agrizzi. #StateCaptureInquiry : Agrizzi now deals with Gwede Mantashe security upgrades at his Boksburg home. "Without a shadow of doubt, all of those installations were paid for by Bosasa and not a Director as alluded to" @TeamNews24 . Agrizzi says the security upgrades done at Gwede Mantashe's house were paid for by Bosasa and not by Papa Leshabane, as previously claimed. In March 2017, he was invited to a meeting with Dahua CEO and Andile Ramaphosa. Bosasa had a contract for camera installation involving Dahua. Company "is linked to Andile Ramaphosa's Blue Crane Capital,” Agrizzi explains. "At some time I avoided doing business with municipalities - I felt that it was wrong". Trevor Mathenjwa was responsible for the contract. Services were not being provided in accordance with the contractual standards, no monitoring took place, Agrizzi says. Pretorius deals with contract between Bosasa and the Department of Justice and Constitutional Development. Agrizzi says the tender was awarded irregularly and "received a lot of resistance from the procurement department." Agrizzi has testified before the Zondo Commission of inquiry into state capture that Dudu Myeni had meetings with Bosasa on more occasions than she let on. R1,25m paid out to the sister of Bheki Gina. Purpose? To provide security, access control in the department of education in Kimberley, Agrizzi says. We adjourn for lunch, to resume at 14:00. They tried to keep me out the loop, but there was a CCTV and access control contract with the Northern Cape Education Department There was no tender prepared for it, made out to be an emergency requirement. This tender was kept far away from me. Things would happen, but I would find out about them because I would need to sign off the accounts. Seopela hired different cars to avoid being traced. Watson called Seophela was the "2.5%" man - because of the fee on each contract. Sesinyi Seopela was referred to as 'The Commander'. Gavin Watson along with Papa Leshabane, Joe Gumede were integrally involved in illegal activities at Bosasa, says Agrizzi. Zondo: Was there any contract Bosasa got for which they didn't pay bribes? Agrizzi explains the Biblical reference to Paul and Silas praising God in prison, and the chains falling off. "I'm a good Catholic", he adds. He says Watson had no office, no secretary, Agrizzi says. Watson did not sign anything. He would sit in my office, people would come in and out of my office and meet with him there, or he would sit in the boardroom. He only had a newspaper with him. Agrizzi says Bosasa also paid for Mti's clothing accounts. Agrizzi: Watson instructed me to buy Mti shoes on Bosasa's credit card at the cost of R19 000. Agrizzi says he witnessed bribes to Mti. Watson often counted cash in front of him allocated to Mti. Agrizzi says he would challenge Watson, whereas everyone else be 'yes' people. Agrizzi: On numerous occasions, ANC members were bribes in his presence. Watson was Bosasa, it was his brand. He was often labelled 'The Godfather' of Bosasa. Agrizzi recalls a flight from Durban which Myeni was on as well, she proceeded to greet him and his wife. She asked him what was wrong with him, he explained that he had resigned from Bosasa. Agrizzi adds that he wanted to stay far away from Myeni and told Gavin not to enter negotiations for a deal with SAA, telling him it was not worth it. Agrizzi claims Myeni was present at at least 4 other meetings other than the official visit to Bosasa. Myeni and Bosasa were in discussion about a catering contract at SAA, Agrizzi says. Agrizzi says he met the former SAA chairperson at the Sheraton Hotel, says Myeni received R300 000 cash for the Jacob Zuma Foundation. Dudu Myeni gave false accounts of her version of Bosasa meetings, Agrizzi says. There were several meetings according to his knowledge.